This erratic and fast-flying Hairstreak can be quite challenging to photograph when they are active on hot sunny days. 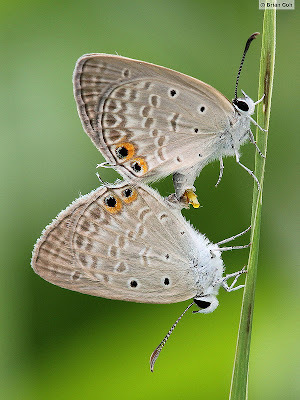 The Gram Blue tends to fly at low level amongst shrubs and grasses in fair weather. At certain times of the day, they can be observed stopping on their favourite perches and open their wings to sunbathe. The male of the Gram Blue is light purple above whilst the female is a lighter blue with dark wing bases. The underside is pale buff with black and dark grey spots and striae. This mating pair of Gram Blues was shot by young ButterflyCircle member Brian Goh at a Park Connector last weekend. The pair was perched on a blade of grass, making a pleasing balance with a vertical composition of the shot.